The multi-process InvertecV350-PRO is an efficient, lightweight and portable choice for training, fabrication or construction applications. Available in Construction, Factory, Factory Tweco and Advanced Process models, the versatile V350-PRO is ready for almost any welding job in shop or outdoor environments. Exceptional Multi-Process Fabrication Welding - CC - Stick Soft. CC - Stick Crisp, DC TIG, CV Wire. For MIG and Metal-Cored, CV - Innershieldand Outer shield Flux-Cored. Arc Gouging Accessible from All Modes Plenty of power to handle a 5/16 in (7.9 mm) carbon. Tbook.com crawls the web to find the best prices and availability on Welders and related Tools and Hardware products like Lincoln Electric 425 Amp Invertec V350 PRO Multi-Process Welder (Factory Model) with 2 Twist Mate Plugs,.... For this page, related items include products we find that match the following keywords: "Welder|Welding" at our vendor partner Home Depot. 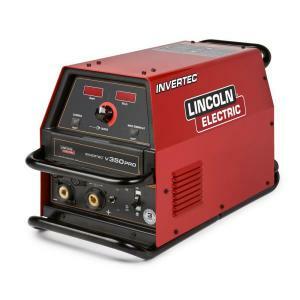 Lincoln Electric 425 Amp Invertec V350 PRO Multi-Process Welder (Factory Model) with 2 Twist Mate Plugs,... is one of 184 Welders and related products listed in the Tools and Hardware section of Tbook.com If you have any questions on this product, please give us a call at 734-971-1210 during the hours of 9am - 5pm EST for assistance. Thank you for shopping at Tbook.com, the Internet Department Store!